When Anna and I bought our property 5 years ago, the only problem was an old, falling-apart shed that needed replacing. Replacing it has been on our “To Do” list every summer for 5 summers, and we finally got around to doing it. I call the shed “old” but it’s actually just not well built: the biggest problem being that the roof is practically flat, so rain water just sat on the roof tiles until it soaked through and destroyed the roof. There were still a few dry patches that were very useful for storage, so we never took it down. This year, we fixed it! Although not as epic as building it ourselves; this was definitely much faster. The hardest pert was taking it down and preparing the foundation for it. 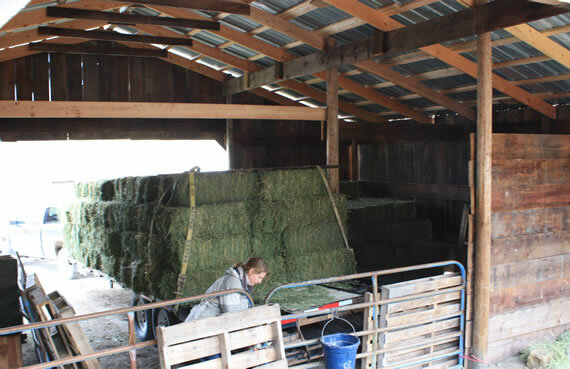 Epic Barn v1.0 – Completed! I really can’t believe it. Old man winter really gave us a break this year. It’s almost thanksgiving and we don’t have any snow on the ground. We got our first snow months ago, but it didn’t stick long enough to be annoying. 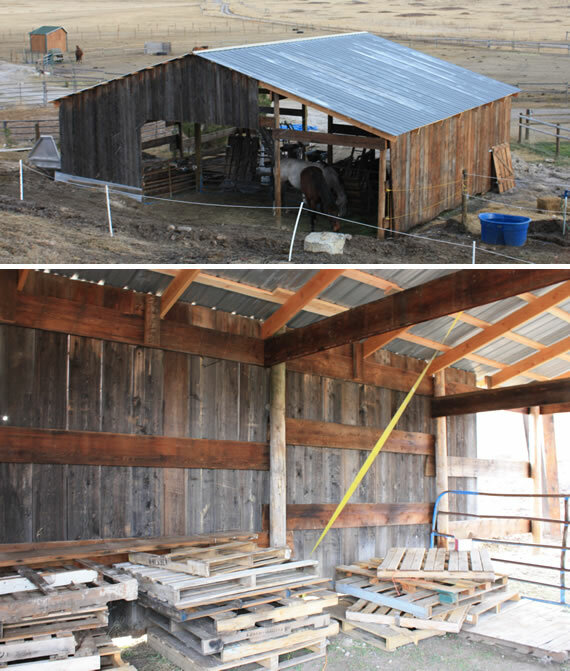 We have completed v1.0 of our Epic Barn! I’m calling it v1.0 because I’m sure we’ll be doing a lot of finishing work on it before it’s really done, but it is dry enough to put hay in! Honestly, this would not have been done before winter if it weren’t for the Stanfield boys. Donald and Casey did so much on the walls, it was ridiculous. Nora and Liana have been testing out their new shelter and, so far, are really enjoying it. Finally, we completed the North wall! Well, I think we can finally say it’s all down hill from here. When I started on this Epic Barn Project, I thought getting the poles all straight and perfectly placed was the hardest part of this barn. Then when I go to the roof, I thought that was the hardest part (as I’ll explain below). Now that we have completed those two difficult tasks, we only have walls left. These walls consist of 2×12 boards nailed vertically to the “cross beams”. Thankfully that doesn’t take a lot of thinking, measuring or calculating to make sure it’s absolutely perfect. 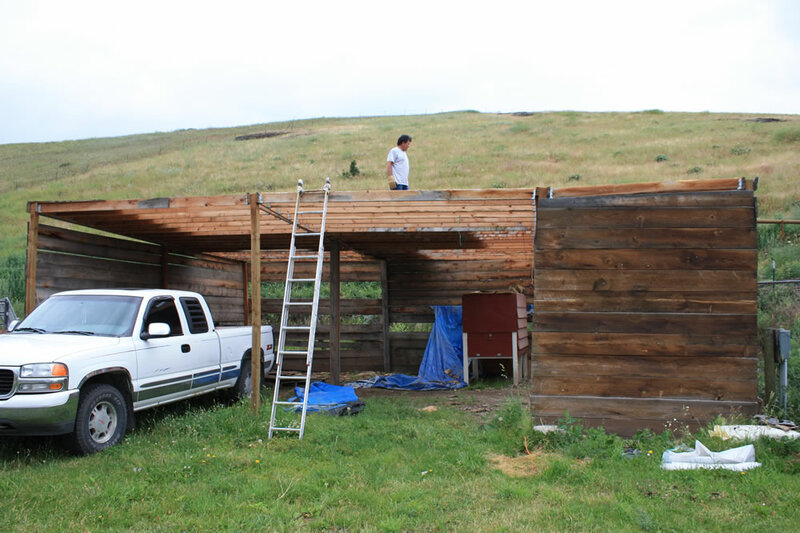 We may run into a couple difficult spots (where the rafters come out of the wall for example), but I think it will be easy peasy lemon squeezy compared with trying to calculate where all the roof purlins go… explained below. Pretty much all of the material we are using for the Epic Barn Project (including the tin roof) came from our neighbor’s barn. 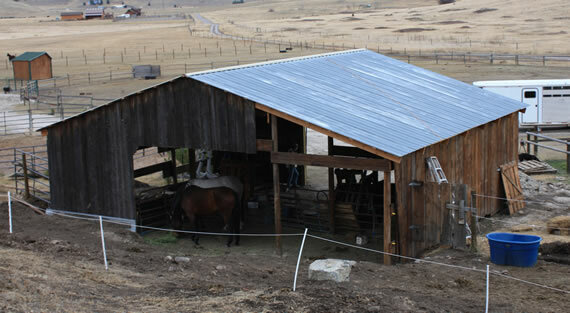 It was just as cool as my barn, but I don’t call it an epic barn because I didn’t build it ;). 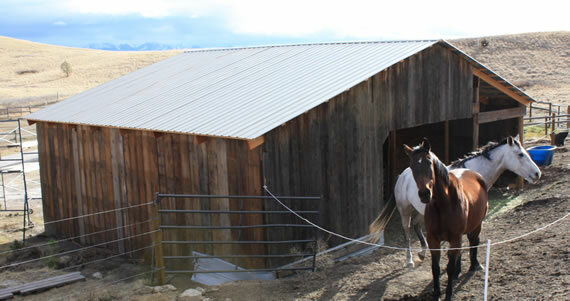 Since the roof tin has already been used on a barn, all of the screw holes have already been drilled through the tin. We got very lucky on this first roof because most of the holes were the same distances from each other and lined up with the purlins (wooden 2x4s we screw the roof to). There was only one small area where the purlins and holes didn’t line up. 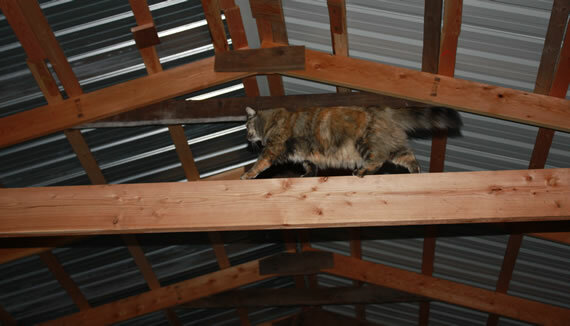 Unfortunately, the other roof was very sloppy. 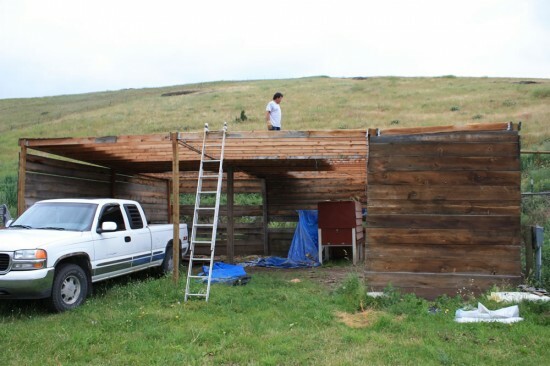 The holes were all over the place because the old purlins were not perfectly lined up. Even the length of the roofing varied by up to 5 inches! In this picture you can see that the holes on the top line up with each other, but the length of the tin extends much farther and the second set of holes (bottom) don’t match up either.